Have you ever wondered where that secret code coffee house lingo comes from? Would you like to be positive that you are ordering your drink right so that it will be made the way you want it? Would you also like to know a few interesting facts that will help you know what not to say? Once you understand the terms and their origins, then you will have the confidence to order like a pro. This will allow you to quickly and accurately get the exact drink you want, while making the coffee shop employee love you for making their job easier. Coffee knowledge is a fascinating topic and there are always fun café slang insights waiting to be discovered for the curious mind. Read on to learn all the terms from black coffee to the most intricate drink details. I will also reveal and decipher the most outrageous coffee order I ever heard in my 8 years as a coffee house manager! To understand the terms and phrases in the most mythical complex coffee house order all you need to know are the foundational names of each type of drink, and the terms for the various extra ingredients. Even the most pretentious and insane coffee house order is a simple combination of beverage type, extra ingredients (or modifiers), and preparation. So who will be making my drink anyway? Hi there! What can I get started for you today? This familiar greeting can be heard from smiling faces working in coffee houses across the country. Whether the shop is a funky independent or a glossy chain, the greeting is usually something very close to that and it implies that the person working at the café is ready to create something unique for you. You just met your barista! The name, barista, is an Italian word that means bar steward or bartender. In the Italian sense of the word, however, the bar being referred to is the espresso bar. Specifically, an espresso bar is the actual machine that the barista uses to make espresso and steam milk for hot drinks. In Italy, where coffee house culture arguably was born, the barista is the person who uses the espresso bar to create handcrafted coffee drinks. However, in Italy, the barista can be elevated to near-celebrity status in their community. They dress more like a formal waiter in a fine restaurant, and their skill and precise flair for coffee creation is rewarded by fierce customer loyalty and prestige. In an American coffee house, the barista is the person who makes the bar drinks. In many cases this person will slide around to other tasks as well, such as cleaning, ringing transactions on the register, and making other drinks such as brewed coffee, tea, or blended concoctions. In other words, the barista is usually a busy person who is highly skilled at multitasking and making it look easy. The foundation of the American coffee experience is brewed coffee. If you, “just want a regular old cup of coffee!” then just say that. Coffee. Don’t be worried too much about what the particular coffee shop you are in calls their sizes. If you don’t know the particular shop’s size names, simply order small, medium, or large and you can be sure that the barista will know what you mean. Feel free to ask for anything you want, like milk, sugar, or room to add your own. The straightforward brewed coffee order is the basis of any coffee house and it is usually the most popular beverage they sell. Be proud to order brewed coffee; there would be no coffee houses without it. Variations on brewed coffee focus on three things: caffeine, roast, and preparation. The caffeine part is simple. There are regular and decaffeinated versions and most shops will feature a decaf option. The subject of various coffee roasts, their flavors, and uses could fill an entire book. However, the basic knowledge is all you need. Roasting coffee is the process of heating dried beans to achieve that warm, roasty, delicious coffee flavor we all know and love. The longer a bean is roasted, the darker the roast becomes. In the simplest terms coffee roasts are rated on a scale from light to dark. Most breakfast blend coffees are medium roast, espresso roast and Italian roast are darker, and in the U.S., French Roast is historically the darkest roasted bean. Many coffee houses will brew light, medium, and dark roast coffees for you to choose from. Try a few different roasts to see what you like best. The process of roasting coffee beans burns off some caffeine, so the darker roasted coffees (often called bold) are actually lower in caffeine than lighter roasts. The different amounts of caffeine in the cup are very slight, but it is interesting to note nonetheless. Therefore, don’t say you want the darkest roast because you need the most caffeine. Beyond brewed coffee there is a wide array of espresso and steamed milk beverages. These drinks and their modifiers (extra ingredients) form the basis of all the complex sounding coffee house orders. An espresso bar does two main things: it makes espresso, and it creates steam used to heat milk. Luigi Bezzera received a patent for his espresso machine in 1901 and effectively invented the concentrated drink we know today. It was originally conceived as a way for Italian workers to get a coffee quickly and one cup at a time. Espresso is made by forcing pressurized, near-boiling water through finely ground, compressed coffee. The resulting pressure creates an infusion of carbon dioxide that generates an emulsion of the oils in the roasted coffee suspended in microscopic foam. These tiny bubbles carry the volatile oils and flavors of the coffee deeper into your taste buds than traditional, flat, brewed coffee. This results in the deeper, richer flavor you experience when you sip straight espresso. Yum. An espresso shot is made up of three parts: the heart (or the dark bottom section), the body (or the blonde colored middle section), and the crema (or the creamy foam on top). A shot of espresso will quickly settle, as the micro-bubbles suspended in the body rise to the top and the darker, more bitter heart rises. Straight espresso, therefore, is best when drank within ten seconds. But the PH of milk will arrest the acidity of the espresso, and allow the rich coffee flavor to last. Hence the addition of steamed milk and the birth of all of the other espresso-based drinks we have come to know and love. A single shot of espresso is called a solo and a double is called a doppio. Three and four shots are called triple and quad. In authentic coffee house lingo, there really is no such term as “trippio”. Trippio is a colloquialism extending from doppio (meaning double) and implies a triple shot of espresso. However, the correct term for three shots of espresso is triple, and the word trippio is simply a made up guess. Don't say "trippio." 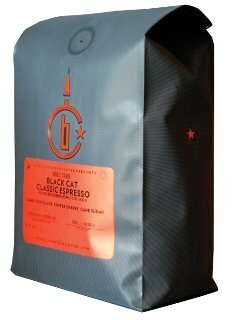 The famous Black Cat Espresso from Intelligentsia in Chicago has been called the best espresso roasted in the USA. It produces amazing crema and roasty-sweet, rich, sturdy espresso shots. It is also delicious as brewed coffee! The foundation for coffee house handcrafted drinks is espresso with some form of steamed milk. Cold milk can also be added for iced drinks. The variations of steamed milk drinks are mainly influenced by the degree of foam achieved when the milk is steamed. When a barista steams milk, they initially allow the steam wand to ride just at the surface of the milk, which causes aeration and gives a foamy texture to the milk. The longer the barista aerates the milk, the foamier it will be. The higher the steam wand is from the surface, the larger the bubbles of foam will be. A steam wand aerating closer to the surface of the milk creates a smaller bubble and therefore tighter, creamier foam. Adding very foamy milk to espresso creates the famous cappuccino. As the cappuccino sits, a portion of the foamed milk settles into hot milk with the foam rising to the top. A perfect cappuccino rests at anywhere from 1/3 milky espresso and 2/3 foam to half of each. Debates about what is ideal will rage forever and are largely a matter of opinion. But a dry cappuccino has more foam than normal, while a wet cappuccino has less foam than normal. The word “Semi” means half. Since a cappuccino is traditionally about half milk/espresso, and half foam, ordering a “semi wet” or “semi dry” cappuccino conveys no real information to the barista, since semi means half, and a cappuccino is already half dry and half wet. If you want your cappuccino foamier, simply say dry. If you want it less foamy (more milk), simply say wet. If you only want it a bit more wet, or a bit more dry, say "slightly wet" or "slightly dry". Don't say "semi wet" or "semi dry", because technically both phrases mean the same thing. A latte is espresso and steamed milk with a thin layer of foam on top. Typically a latte is far less foamy than a cappuccino and features about ¼ inch of foam on top. Lattes can also be made iced, by the addition of cold milk and ice to espresso. The iced version of the drink is normally devoid of foam. Skilled baristas can manipulate the poured milk to create designs in the top of the latte foam. These designs, created by the contrasting colors of swirling espresso into foamed milk, are called latte art. Latte art has been elevated into a mater of flair and style by the finest, most practiced baristas. A macchiato is an espresso with a small amount of milk foam added to the top. The word is Italian for “marked” or “stained” and refers to the mark that the white foam makes on top of the darker espresso shot or shots. Starbucks Coffee Company also sells a beverage named the Caramel Macchiato, which is a vanilla latte topped with shots of espresso and caramel drizzle. In this drink, it is the espresso that marks the top of the foamed milk (as opposed to the foamed milk dollop marking the top of the espresso in a traditional macchiato). To distinguish from the two, at Starbucks, the traditional macchiato is called an Espresso Macchiato. In coffee land, mocha means coffee with chocolate. Since, in a coffee house, you are so often talking about coffee anyway, the term mocha has come to most often refer to the chocolate side of things. Café mocha is a latte with mocha syrup added to give the drink a chocolate flavor. The term mocha comes from the name of a port city in Yemen Africa on the Red Sea. In the age of sailing ships the port of Mocha often shipped out coffee and chocolate or cocoa beans on the same ships. Therefore mocha became synonymous with coffee and chocolate together. Breve means abbreviated and is coffee house lingo for half-and-half, or milk that is part cream. Usually the half-and-half added to brewed coffee is simply called cream, and half-and-half steamed for bar drinks is called Breve. From simple to complex. 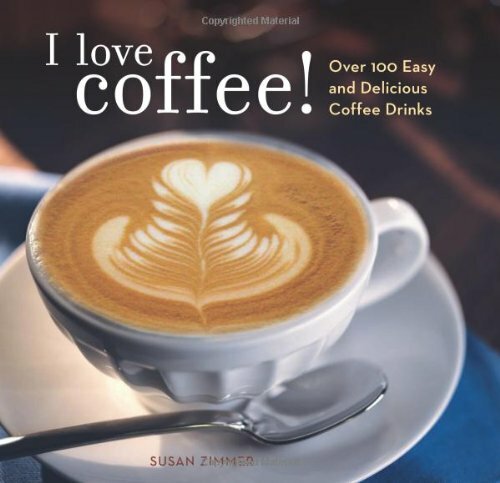 This book is great for baristas and home coffee lovers alike. A flat white is an espresso drink arguably invented in Australian coffee houses in the 1970s. The flat white features microfoam (very creamy tightly foamed milk) poured over espresso shots. The flat white is made using a low ratio of milk to espresso, resulting in a drink that is stronger, coffee wise, than a latte. A cafe Americano is espresso and hot water. It approximates a cup of brewed coffee and was invented to serve American servicemen stationed in Italy who did not have a taste for the tiny strong Italian espresso served in the coffee houses. To me a café Americano tastes like instant coffee. Affogato is espresso poured over ice cream. Traditionally it is made using vanilla ice cream. It is one of the most amazing tastes in the coffee shop world, even though it is not exactly a beverage. Some coffee houses will put a shot of espresso on top of your blended frozen coffee drink. This is referred to as affogato style, in reference to the espresso over ice cream version. An antoccino is a solo espresso with an equal amount of steamed milk. It is essentially a tiny, super-strong latte. The small amount of milk keeps the espresso from condensing into a pure acidic heart, so it can be savored for more than ten seconds. Passion, deceit, espionage, and intrigue. And that is just the half-caf of it. 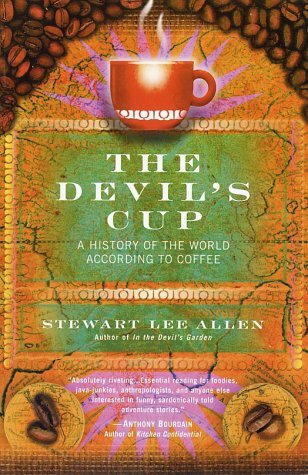 This is one of my favorite books about the amazing history of coffee and how it has shaped the world. Chai is concentrated black tea infused with strong spices such as cinnamon, ginger, and clove. Steamed milk is added to concentrated chai syrup to make a chai latte, or chai tea is available in tea bags to make brewed chai tea. Normally chai tea concentrate is very high in caffeine. A dirty chai is a chai latte with espresso shots added (one of the most highly caffeinated drinks you can order). Now that you know the basics of coffee shop beverages, it is time to add the extra ingredients that make it taste the way you like it. In the language of the barista, these extra ingredients are called modifiers. Typical modifiers include sugar, cream in brewed coffee, and flavored syrups. Most coffee houses feature a wide variety of flavored syrups. Normally syrups are added to lattes but anything is fair game. Flavored syrups include vanilla, hazelnut, peppermint, cinnamon, caramel, mocha, and a nearly endless list of others. All of the other branded artificial sweeteners, such as splenda, equal, and the like are considered modifiers as well. In addition, toppings such as cinnamon powder, nutmeg, and cocoa powder are often added to finish off a drink. The description of the way you like your drink made is the preparation. In most cases you can trust your barista. All the various coffee house beverages have evolved over years to accommodate the differences in customer tastes. Try one or two the way your coffee shop makes it and see if you like what they do normally. Standard preparation instructions include extra hot, less hot, a specific amount of sweetener, decaf if you want that, any of the various syrups, how wet or dry you want a steamed drink, and the toppings if any. Rated 4.6 out of 5 stars with over 75 reviews! 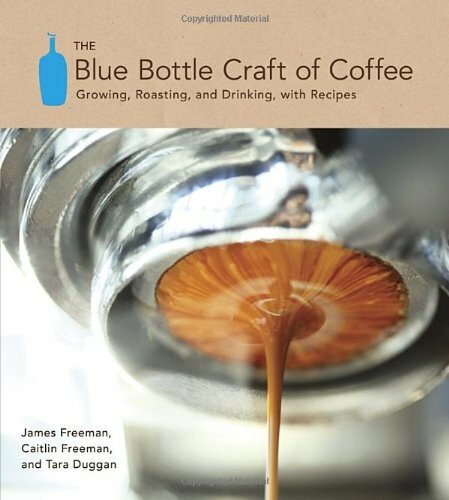 Highly recommended for baristas, or anyone passionate about coffee knowledge. How to choose, brew, and experience the finest coffees in the world today. If all of this sounds complex there is no need to worry. Ordering your favorite drink is actually a simple process. All you need to do is order the drink basically from the bottom up. The order is basically cup size, beverage type, number of espresso shots if different than normal, decaf if so, preparation details, and the modifiers if any. So if you wanted a small cappuccino with one shot of espresso, two sugars, and cinnamon powder on top, you would order a small cappuccino with two sugars and cinnamon powder. A medium triple decaf nonfat iced latte with one sugar would get you a slightly sweet iced latte with three shots and skim milk. A large dark roast brewed coffee with room would be a brewed dark roast coffee with space at the top of the cup for you to add your own cream to taste. And finally, a small wet upside down cappuccino would be a solo cappuccino with more milk than foam and made with the espresso shots added at the end, on top of the foamy milk. The Most Complex Coffee Drink Order Ever! May I please have a medium, triple, 1/3 decaf, half soy milk, half breve latte, extra hot, with only breve foam, and the third shot decaf and upside down, with one raw sugar, a half regular sugar, a half pump of vanilla and whip cream on top but before the upside down shot. Yes that drink order is true, I even wrote it down that day and the baristas in the coffee house I was managing at the time saved the receipt. The customer (who shall remain nameless) actually became a regular and ordered her drink that way until the baristas knew it by heart. Once you are familiar and understand the beverage types, modifiers, and preparation details you will be able to order with the best of them. Always ask your barista if you have a question. They are professional coffee experts and they can help you learn to order your drink exactly the way you like it. Now you can visit even the trendiest coffee house armed with some inside knowledge and remember to just have fun with it. Even the most skilled and experienced baristas will likely admit that they learn something about coffee everyday. Learning to order like a pro at a coffee house will assure that you always get your delicious coffee beverage exactly the way you like it. Wow!!! I thought my tall-in-a-grande, half caff, skim, no whip mocha was complicated. I have since switched to a tall, skim, vanilla chai, but this was a great read. That lady needs to make her own drink at home. Seriously. I'm still laughing at "one raw sugar, a half regular sugar". Hi MatthewsCD , Awesome thank you. Yeah that order kills me too. My thought was always, "How did you EVER come to that?" The baristas used to say (to themselves of course) "Are you kidding me? People are starving!" Also, you always know something crazy is coming when the customer pauses dramatically then says, "Okay" before they tell you their order. Too funny!